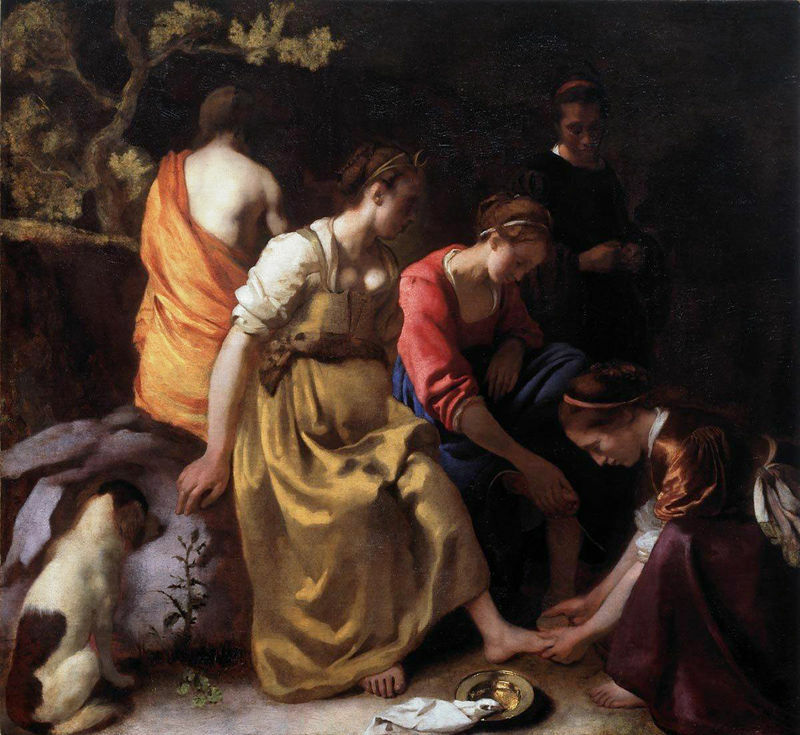 Vermeer was a realist painter who focused on chiaroscuro and became a master in using this technique. The artist delighted in the technicalities of the camera obscura that had emerged in Dutch markets at this time and was an avid fan of using various lens and glass contraptions to discover new forms of capturing light in various contexts. There is little information about Vermeer's personal life. 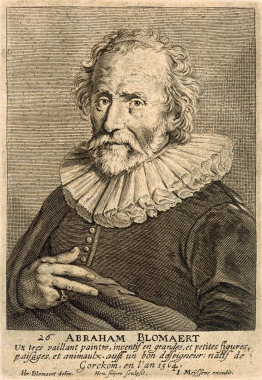 He seems to have devoted his time to his work and never left his hometown of Delft. 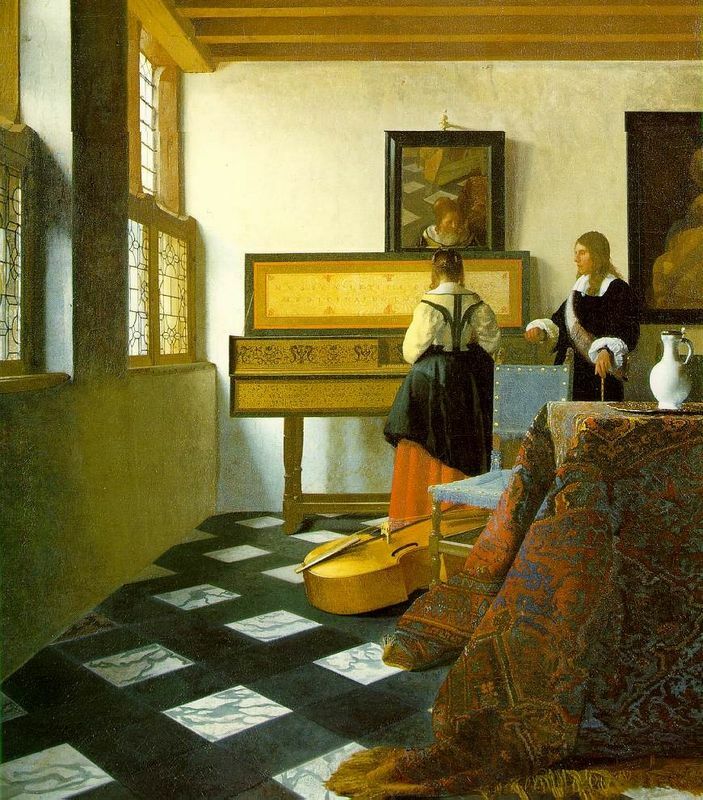 The mystery surrounding Vermeer led to Thoré Bürger naming him "The Sphinx of Delft". Johannes Vermeer was born to Reijnier Janszoon and Digna Baltens, middle-class innkeepers and prominent silk weavers in the city of Delft. His father later changed his surname to Vermeer but the reason for this remains unknown. Vermeer's father was a member of the Guild of St. Luke where he traded and sold various paintings. It was from this profession that a young Vermeer learned all about art. Johannes Vermeer was the only son in the family and had just one sibling. He was raised Protestant in a largely conservative Catholic province and later became part of the Guild of St. Luke. It is believed that he apprenticed under Leonart Bramer but no evidence can conclude that he had an influence on Vermeer's works. Other art historians propose that Vermeer served under Carel Fabritius but again, evidence to prove this is lacking. Some scholars claim that Vermeer was in fact, taught by the Catholic painter Abraham Bloemaert. In Vermeer's early career he focused on producing history paintings, creating scenes from the Bible and classical mythology. Seventeenth-century academic theory reports that this was the highest form of painting because a history painter had to use their imagination when creating these works. However, other subjects appealed more to Vermeer and later on he chose to paint everyday life scenes instead which were probably also popular at that time. In April 1653, Vermeer married Catharine Bolnes, a wealthy Catholic woman from a higher class family. Upon marrying Catharine, Vermeer moved to the predominantly Catholic neighborhood in Delft. He and Catherine had fifteen children together but four died at birth. None of the surviving eleven were known to inherit their father's skills. 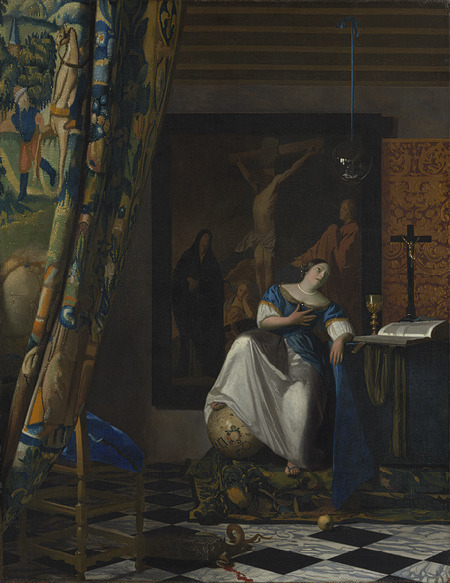 Catherine modeled for many of Vermeer's great works including Woman Holding a Balance and Woman Reading a Letter. He also included various images of his children in works such as The Little Street. Thanks to his mother-in-law, Maria, Vermeer gained access to the wealthiest citizens of Delft such as Pieter van Ruijven. Yet, unlike most if his contemporaries, Vermeer never left his home town and relied solely on local patronage for his commissions. Johannes and Catherine are believed to have lived a happy married life until Vermeer's untimely death in 1675 from what is assumed to have been a stroke. They were married for 22 years. Catharine was supportive of her husband's work and tried to save as many of his paintings as possible when she was summoned to hand them over to the state to repay her husband's debt. Like most artists during these times, Vermeer also accumulated a series of debts which were left to his family upon his death. 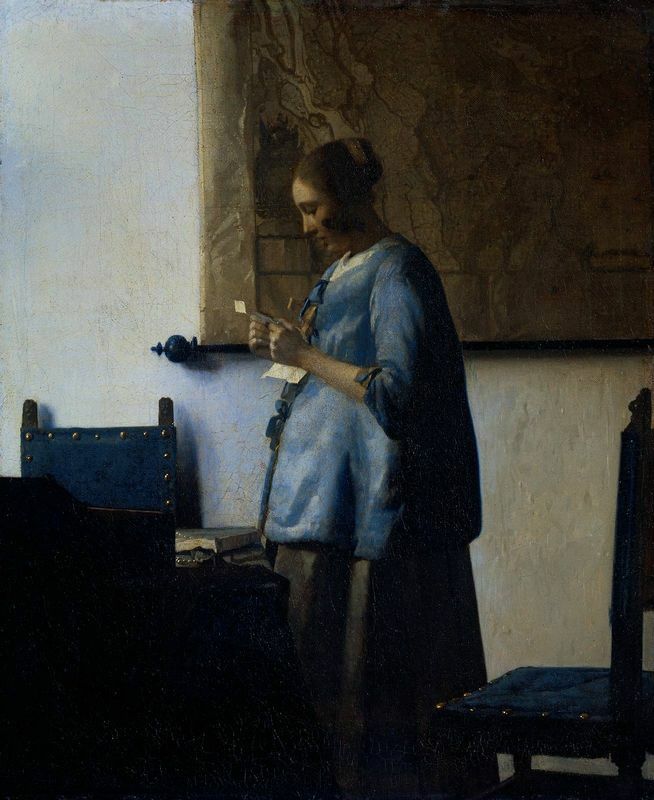 Vermeer's success suffered due to the fact that he was unable to find patrons outside of Delft to buy his work. His downfall can also be contributed to the fact that he never left his home town to market his works and talents elsewhere. Vermeer, unlike Rembrandt, did not work with etchings or engravings which were popular at the time. As Delft was located in the southern part of the Netherlands, it was constantly being invaded by Spanish troops which greatly affected the economy and art market, adding to Vermeer's problems.